In August 2007, we challenged Ballardites to try eating locally for one month. Then again in September 2008 we joined other groups across the country in an Eat Local Challenge month!! The goal was to try to get everything that we eat from within 100 or 150 miles and really raise awareness about where our food comes from. We wanted to make this a huge community event and provide information and a support group for people eating locally while raising awareness about local foods in the greater community. The results of our efforts are documented in our 100 Mile Diet blog. 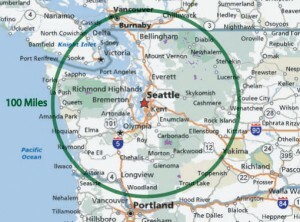 Ever wonder how much pasture and farmland we have in cultivation near Seattle? Check out Matt’s map showing the amount of farmland within 50 and 100 miles and join the discussion of how many people can be fed off the available farmland.